In-Depth: In-Car Payments Gears Up but Takes Time to Get Rolling | NFC Times – Near Field Communication and all contactless technology. Visa and Sirius XM Holdings this week announced a tie-up to introduce in-car payments to SiriusSM subscribers at some future date. While most major carmakers and networks are working on payments as part of the connected car and a few services have launched, development cycles are long. 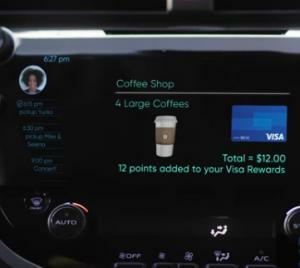 Visa and Sirius XM Holdings this week announced one of the latest deals as part of the industry’s move toward the connected car, which would offer a range of interactive infotainment, commerce and other services. The Sirius XM-Visa deal would enable remote payments in vehicles to Visa cardholders via an e-wallet added to the SiriusXM platform. Rival payments network Mastercard, which had announced one of its first major in-car payments deals nearly two years ago with General Motors and IBM, followed Visa’s announcement with Sirius XM this week with its own press release Wednesday, saying it had a tie-up with mapping and location-based services firm HERE Technologies.